The Leica DMIL Microscope provides ideal, vivid lighting, and ergonomic design with excellent stability. 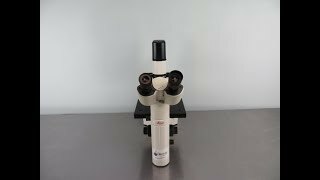 This compact inverted microscope is ideal for all applications in cell cultures or microbiology, and acts as a universal microscope with modular, upgradable optics. The stand of this phase contrast microscope is designed with stability in mind, with a sturdy aluminum cast T shape, that allows for freedom of movement and comfortable use, with vibration dampening feet for vibration free use even in extreme conditions. The Leica DMIL comes with a binocular head set at a 45° viewing angle, or can be changed to a trinocular head, sold separately, for the addition of a camera. The Leica DMIL Microscope is space saving and modular, allowing users to add features as needed, changing the head for photography, swapping out optics as needed, and change filters quickly and easily. This inverted microscope has nose piece focusing, with a quadruple objective nosepiece un affected by the stage, or components, as well as a compact adjustable brightfield, a pre-centered 35W halogen lamp, and a contrast slider with DLF Filter and 1/S55 Phase Ring. Phase contrast microscopy is an excellent way to view undyed, living, cultures and microorganisms, producing excellent contrast in watery or dry preparations. This flexible inverted microscope can be used for brightfield, phase contrast, Integrated Modulation Contrast (IMC) and incident light fluorescence with the integration of the right units. This Leica DMIL Microscope has been fully inspected and the optics are clear. All of our lab equipment comes backed with our standard warranty. Should you have any questions, please don't hesitate to contact us.